A unique feature in the Town of Gale is "Rustic Road 91" which connects to State Highway 54 just east of Galesville at the east end of Decorah Prairie. 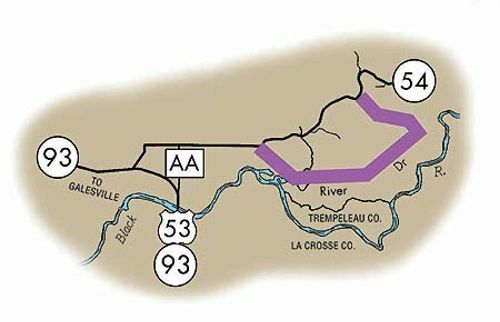 This unpaved road passes over Grant Creek as it winds through the wooded edge of the Black River bottoms and connects back about two miles east on Highway 54. Map courtesy of the Wisconsin Dept. of Transportation.